Based on reviews from 195,592 users. Learn how our rankings work or see our guide to white Adidas sneakers. Updated Apr 2019. Among the full range of colorways offered in the market - blue, red, green, gold, silver, pink, black, purple, orange - the color white is considered the hue that has continually reigned the sneaker game. Many known brands in the fashion world have their versions of white kicks in their arsenal to suit their loyal followers. This colorway has been a perennial favorite for its trouble-free way of pairing up with almost any casual ensembles. It is practically impossible to go wrong with white sneakers that will save you from the trouble of pairing your sneakers with various outfits to come up with that effortless style. 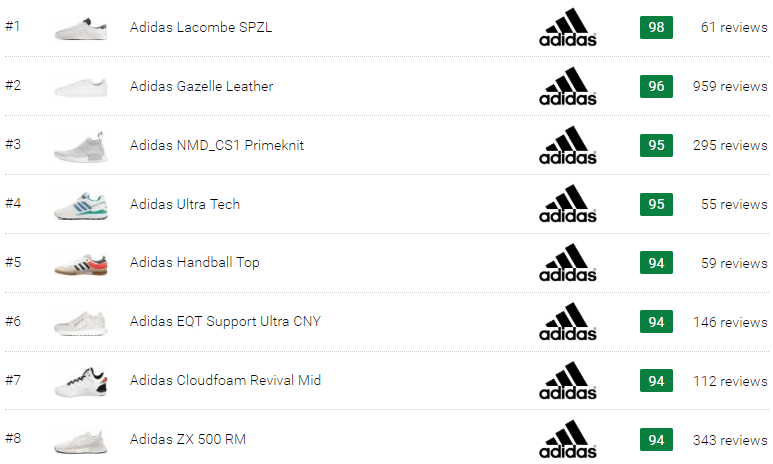 Keep scrolling down as our team has come up with our sweet list of some popular and high-rated Adidas sneakers in white hue currently available in the market. Since its inception, the Stan Smith has undergone subtle modifications over the years. Its straightforward leather upper with perforation and green heel padding, and the striking caricature of Stan Smith on the tongue have seamlessly turned into one of the iconic elements in the sneakers world. With the countless versions of Stan Smith available in the market, many fashion magazines have considered the Adidas Stan Smith one of the most versatile pairs to own. This model has fueled the fashion world into the white sneakers craze, and many brands followed suit and launched their versions of low-top white sneakers. Sizes available for men are from 4.5 to 20 US in medium width. Other popular variations are the Adidas Stan Smith Primeknit, Adidas Stan Smith Bold, Adidas Stan Smith Sock Primeknit, Adidas x Raf Simons Stan Smith. Running next to the popularity of the Stan Smith is the Gazelle which easily gained its iconic status for its more than 50 years of existence. This model was the very first model with suede upper thus giving it more flexibility and lightness without sacrificing the protection on foot. This model peaked its popularity in the 80s when it became a part of the 80's sub-culture and worshipped by various genres, such as reggae, hip hop, grunge, and Britpop. Today, the Gazelle has endured various modifications and reinterpretations by several fashion brands, retailers, and celebrities to play the difficult modern sneakers game. Size range available for men is from 6 to 14 US in medium width. Other popular variations of these all white Adidas sneakers for men are Adidas Gazelle Cutout, Adidas Gazelle Stitch and Turn, Adidas Gazelle Primeknit. The Arkyn from Adidas was conceived in April 2018 from the Adidas Originals collection. 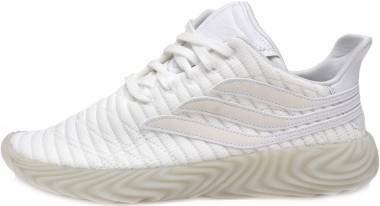 This model was inspired from the impressive line up of Adidas profiles that have been modernized to deliver a new message in the women streetwear fashion. The Arkyn perfectly fused style, culture, creativity, and sports creating footwear with modern aesthetics and advanced comfort. The sock-like upper with Boost midsole ultimately provides comfort and snug fit that can serve its wearers all-day. Women's sizing available is from 5 to 11 US in medium width. Another variation is the Adidas Arkyn Primeknit. The Everyn sneaker took its cue from the Adidas Stan Smith injected with contrasting heel counter and perforations on its upper. Meanwhile, the oversized toecap is reminiscent of the iconic Adidas Superstar. This kick is offered in pastel and neutral colorways which makes it easy to pair up with almost any casual attire. Women's sizing is from 5 to 11 US in medium width. The triple white colorway contrasted with soft gray suede of the Adidas Falcon is considered its one of its most notable hues. 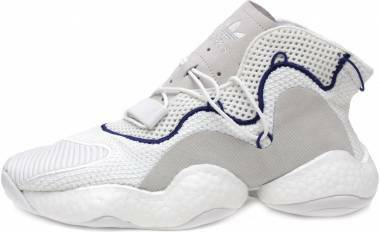 It was unveiled by the Adidas Originals stirred from the chunky 90s running profile modernized to suit the dad-shoe of the current fashion trend. Sizes offered are from 5 to 10 US in medium width, in women's only. The Adidas Originals Swift Run was taken a cue from the 80s running footwear that has been revolutionized for the modern market. It displays the breathable and lightweight Primeknit upper seated atop a white EVA midsole and black rubber outsole. This model debuted in all-white colorway which easily gained followers in the fashion where white kicks dominated the market. Size range in men's is from 4 to 13.5 while women have a size range of 5 to size 11 US in medium width. Other variations are Adidas Swift Run Primeknit and Adidas Swift Run Summer. 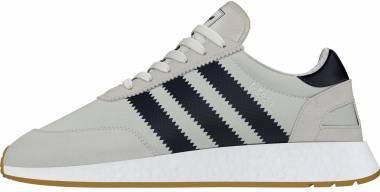 Debuted in 2016, this model was unveiled as Iniki that resembles the profile of another popular silhouette, the Gazelle. This sneaker gained popularity for its retro vibe fused with modern appeal. Men can pick from sizes 5 to 14 while women can choose from sizes 5 to 11 US in medium width. Another special variation is the Adidas I-5923 Pride. This model is based on the Adidas Pro Model sneaker from the 60s and unveiled as a low-top basketball shoe with leather upper and rubber shell toe. This model was seen worn by one of the basketball legends Kareem Abdul-Jabar which helped this model consigned in the spotlight as the in-demand hard court kick in the 70s. For solid 50 years, the basketball-inspired Superstar is one of the most sought-after sneakers of all times and continually reigns the modern market. This kick has been one of the favorites base models for collaborations to suit a wide range of followers. Men can select from sizes 4 to 20 and sizes 5 to 11 US in women's both in medium width. Other popular variations of Superstar in white colorway are the Adidas Superstar 80s, Adidas Superstar Slip-On, Adidas Superstar 80s Metal Toe, Adidas Superstar Metal Toe, Adidas Superstar 80s Cutout. To revive the company, the Adidas thought of creating a silhouette that is out of the ordinary that bears only the essential and nothing that is not. 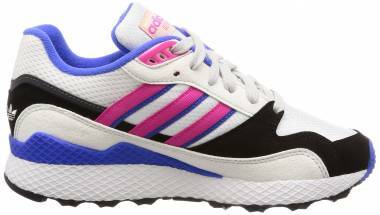 In 1991, the company created the Equipment line or EQT that consists of fuss-free profile that dropped the Trefoil logo and used the 3-Stripe performance logo. 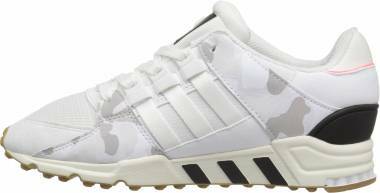 The Adidas EQT Support ADV was first unveiled in 1991 as sophisticated running footwear bearing the Torsion technology. It was revived 25 years later as a modern lifestyle sneaker revamped with advanced technologies to enhance the overall comfort and durability. Men have sizing from 7 to 14 US while the women have sizes 5 to 11 US in medium width. 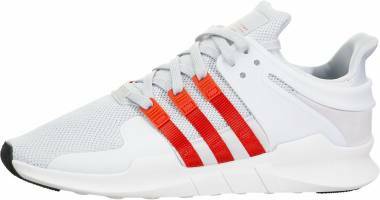 Other variations are the Adidas EQT Racing ADV, EQT Racing ADV Primeknit. The Cloudfoam technology was devised by the NEO sub-brand of Adidas that specifically targets young consumers without breaking their pockets. This tech is a lightweight cushioning resting on top of s sleek and robust rubber outsole. There are several NEO sneakers incorporated with this technology, and one of it is the Adidas Cloudfoam Ultimate. 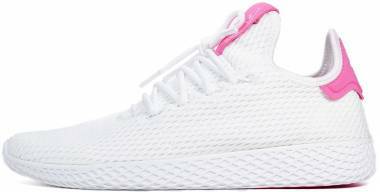 These all white Adidas sneakers feature knit upper that allows comfy snug on the wearer's feet with a thick rubber outsole that provides durable and lightweight traction. The brand offers this in multiple striking colorways that can surely match whatever preference of their buyers. Sizes available for the men are from 4 to 14 and women have 5 to 11 US in medium width. 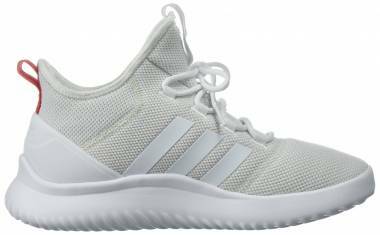 Other notable white Adidas sneakers with Cloudfoam technology are the Adidas Cloudfoam Pure, Adidas Advantage Clean, Adidas Cloudfoam Daily QT Mid, and Adidas Cloudfoam Racer TR. Before the NMD, Boost, and the EQT craze, Tubular was conceived by the Adidas in the 90s that highlights a design stirred from the car tires. However, because of its design that is way ahead of its time, it did not take off quite impressively in the sneakers market. Nic Galway, VP for Adidas Global Designs, saw so much potential in the Tubular silhouette that he decided to unearth this profile from the archives in 2014. 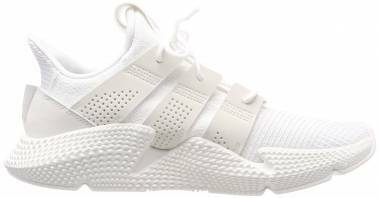 The company re-introduced this model as the Tubular Runner that is intended to champion the lifestyle scene. Fast forward, the Tubular has achieved its recognition worldwide as one of the most fashionable models in the breadth of Adidas and was launched with countless variations through the years. One of it is the Adidas Tubular Doom Sock Primeknit, which was the improved and more lightweight version of the Adidas Tubular Doom launched in 2016. Sizes offered are in men’s sizes from 7 to 13 US and in women’s sizes from 5 to 11 US in medium width. Other variations of Tubular in white tint are the Adidas Tubular Dawn, Adidas Tubular Entrap, and Adidas Tubular Defiant. Adidas dug through their archives to re-interpret one of their classic running shoe from the 70s. The brand came up with the Iniki Runner silhouette that blended the retro profile with contemporary materials, perfectly. This model features stretch mesh and suede upper with a hidden sock-like structure for easy on and off design. It also boasts it Boost technology on its midsole to provide ultra-responsiveness to its wearers for day-long comfort. Men can pick from sizes 4 to 14.5 and women can choose from sizes 3 to 13 US in medium width. The Adidas Iniki Pride, launched in April 2017, is one special version of this model that gives homage to the LGBTQ community. This updated version of the NMD_CS1 debuted in 2017 and said to be taken from the vintage models, such as Rising Star, Micropacer, and Boston Super. This model highlights the Primeknit upper with a design inspired by the Japanese. The upper is embellished with lines constructed in an innovative way that is seated atop the Boost technology. Meanwhile, the collar of this model was inspired by the Japanese kimono- wrapped around design. Men can choose from sizes 5 to 13 while women have sizes 5.5 to 11 US in medium width. This model is the very first profile launched under the NMD series that was patterned from several running footwear but constructed to fit the lifestyle fashion. The soft upper hugs the feet comfortably enhanced with the Boost technology on its midsole. Meanwhile, the stability plug found on the midsole delivers the fresh appeal to the white Boost while providing added durability and support. Men have sizes 5 to 14 while women have 5 to 11 US in medium width. 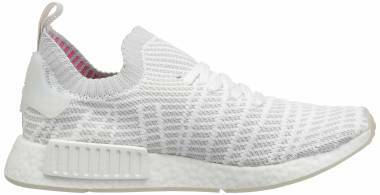 Few important variations of NMD_R1 in white hue are the Adidas NMD_R1 STLT Primeknit and the Adidas NMD_R1 Primeknit. One year after it launched the NMD_R1, Adidas introduced the NMD_R2 that revamped few minor elements to give its wearers better fit and comfort. This kick resembles its predecessor but with tweaked big midsole block on its medial side as the replacement to the NMD plugs. Also, the full-length Boost midsole adds lavish appeal without giving up its athletic roots. Men have sizes 4 to 14 while women have sizes 5 to 11 US in medium width. This model flaunts hoops kick profile rebooted for the lifestyle fashion. This minimalist kick is offered in several colorways, including the grey and white. These Adidas shoes are made of Nubuck leather upper with mesh collar. Sizes offered in men are from 6.5 to 15 and women have sizes 5 to 15 US in medium width. How to clean white Adidas sneakers? First, clean out any excess dirt that can be scrubbed off on the surface of the leather or rubber. You may use sneaker cleaner or with soap and water. Remove the laces and soak them in soapy water. Take the insoles out and gently brush or wipe the dirt. Air dry it, and you may sprinkle baking soda to remove any bad odor. Use soft brush or cloth with gentle soap and lukewarm water when cleaning your shoes. Air dry is the most recommended method, and it is recommended to avoid using the washing machine as it can deform and break your white sneakers. What to wear with white Adidas casual sneakers? Don basic pieces such as a plain t-shirt, blue denim jeans with white sneakers to look more elegant while staying simple. For up-to-date look, you may add checkered polo over the plain white shirt and simple denim jeans. For more laidback get-up during the summer days, drop the blue denim jeans and wear a pair of shorts instead. You may also pair this versatile kick with beige trousers with a solid-colored t-shirt with a blazer for a more polished look. Wearing formal attire with white sneakers is also an excellent choice for a smart casual appeal. Where to buy white Adidas sneakers? Because of its popularity, white Adidas kicks are almost always readily available anywhere. These sneakers are available in countless Adidas' and partner retailers' physical stores. Also, many online retailers sell these sneakers too, such as the Amazon, eBay, Eastbay, Zappos, End, Finish Line, Caliroot, Zalando, and many others. 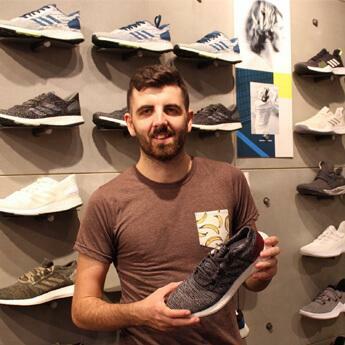 For easy online shopping, the RunRepeat team collated reviews of numerous white Adidas sneakers found online. You may type the name of your preferred kick or enter 'white Adidas sneakers' in our search bar to get the list of the most notable ones currently available in our countless partner retailers. 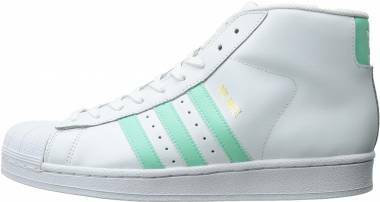 What is the price range of white shoes from Adidas? The price range of white Adidas footwear is from $60 to as high as $220. The most affordable one is the Adidas Stan Smith, despite its iconic status, has remained inexpensive over the years. What are the Adidas technologies used in most of their white shoes? Cloudfoam technology - this tech is offered under the NEO sub-brand that provides cushy underfoot for day-long comfort. Boost technology - this midsole tool delivers responsive cushioning that easily bounces back to its original shape even during the hottest days. This characteristic maximizes the energy return, thus giving a more consistent run to its wearers. Primeknit upper - this material is conceived from digital knitting that gives a fine-tuned amount of support, flexibility, and stability of vital areas of the foot. Are there Adidas white sneakers that are products of collaboration with other brands/celebrities? Yes, numerous Adidas white shoes were formulated from partnerships with various names. One example is the monochromatic colored Adidas x Raf Simons Stan Smith, the Creative Director of Calvin Klein. Another collab is the red and white Adidas shoes dubbed as Pharrell Williams x Adidas Stan Smith Small Polka Dots. Another collaboration is the grey and white Adidas shoes called the Adidas Y-3 Pure Boost, which is the product of the partnership with Yohji Yamamoto. Is there a white Adidas sneaker from the Yeezy collection? Yes, there are few Adidas white kicks that belong to the Yeezy collection. 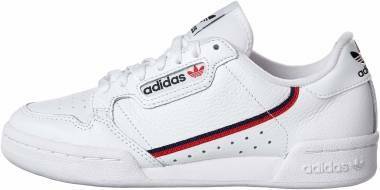 One of it is called the Adidas Powerphase Calabasas which was said to resemble the classic kicks from the Reebok. This model departed from the usual flashy designs of the Yeezy kicks. Another white kick is the Adidas Yeezy Boost 350 V2 in Triple White colorway. These all white Adidas shoes have white Primeknit upper, side stripes, and the semi-translucent midsole giving this model a clean and pristine look. Another popular black and white Adidas shoes are the Adidas Yeezy Boost 350 V2 Zebra. Are white Adidas shoes durable? Adidas products became popular for its on-trend design, innovative technologies, and unparalleled durability. The lifespan of their sneakers depends on how the wearers use their white sneakers. If properly taken cared of and used only for the casual strolling on the city streets, these shoes will last for three years or more. Aside from Adidas, are there other brands that offer white sneakers? White is the most versatile colorway that could be easily matched with any attire - casual, sporty, or even with formal. That is why most of the brands offer this colorway to suit their avid followers. These brands are Nike, Reebok, Puma, Vans, New Balance, DC, Ecco, Asics, Skechers, Onitsuka Tiger, Converse, Under Armour, Gucci, K-Swiss, Tretorn, Keds, Balenciaga, and many more. What does the color white represent? The color white signifies several meanings in our lives. It has been described as a positive color that is correlated with purity, innocence, heaven, safety, virginity, cleanliness, beginnings, spirituality, softness, and perfection. In the plain view, white is a bright color that sometimes can cause a headache and sometimes it can be blinding in the extremely bright light.